Our project received overwhelming community support and we were able to share the stories of our urban Indigenous women from London, Ontario locally and around the world. Our efforts were recognized with the Pillar Community Innovation Award, the highest award for innovation in the non-profit sector for the London area, in November 2017 at an event attended by over 900 attendees. We received extensive media coverage related to our nomination and receiving the Pillar Community Innovation Award and a short documentary was created that publicized our program. We held two 7-week sessions of the Positive Voice program. The women who participated received a camera, USB card reader and SD card to assist them in creating digital media. They interacted with guest speakers, Indigenous artists, and government officials. They created memes and infographics, took photos and wrote stories about their experience as Indigenous women. They received prints of their projects and created portfolios to use for future employment and education. Participants also received postcards of their work and a photobook filled with all the participants’ projects. We partnered with the London Public Library and the McIntosh Gallery to hold two-month long exhibits of the content created by the participants in the program; one exhibit took place in September 2017 and one in January 2018. The exhibits included photography, stories, memes, infographics, beadwork, and tree of life sculptures created by the women. The exhibit openings included speeches by program participants, traditional dancing, spoken word, poetry, singing, and drumming. Attendees at the receptions included friends and family of the participants, community members, and patrons of the library. The exhibit in September 2017 received local and national news coverage. The exhibit opening in January 2018 was standing room only and video footage of the opening recorded by a reporter from the London Free Press was viewed 4388 times. We also had booths at the Home County Festival, a music and arts festival in July 2017, and the Harvest Festival and Powwow at the Museum of Ontario Archaeology in September 2017. 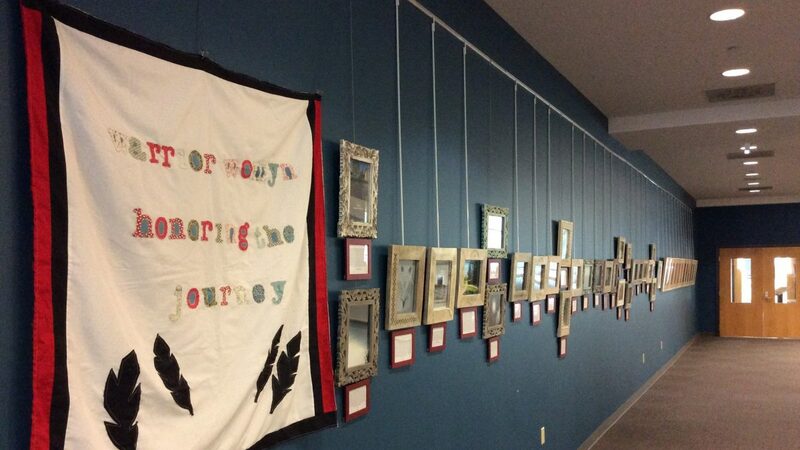 We created a pop up art gallery and shared hundreds of postcards created by the women. These postcards have travelled all over the world from Europe to Australia to South America, sharing the positive portrayal of Indigenous women and their accomplishments. We also shared their projects on Twitter, Facebook, and Instagram.